I need to have a front windscreen with demister wires made for my '82 Toyota Supra rally car. I read somewhere that a custom screen can be made in China - the problem is I can't find the magazine I read it in! Do you or your readers have any leads? We haven't seen any literature covering this topic. Readers - we're looking to you! Considering that the Aussie dollar value is currently 10% up on the Kiwi dollar this makes the comparison even worse. Do you know of any reason for the great variation? Is it viable to import these vehicles from NZ? I'm soon going to be doing a SR20DET swap to my 1993 Nissan 240SX (American market). I was wondering what SR20DET motor I should install and what will need to be changed or upgraded from the stock car? The S13 SR20DET conversion is usually fairly straightforward so long as you have the appropriate gearbox, tailshaft, ECU, loom, sensors, etc. Since your car is left-hand-drive, however, there might be some clearance issues. Try contacting Adelaide Japanese Imports . They do a lot of exporting and might know of somebody who's tried the same conversion. The best SR? We reckon the latest is the greatest - the S14/S15 engine with variable inlet cam timing. I was wondering if you ever have thought of doing a Do-It-Yourself launch control/anti-lag system for modern EFI cars? A signal from the rpm wire could be used to cut power to the ignition and an on/off switch could be hooked up to a sensor on the clutch. In this arrangement, when the clutch is depressed, the rev limit would be about 5500 rpm and you could hold the throttle flat to the floor for launch. You could also flat shift through the gears. It would be pretty cool if you developed something like that which is cheap and simple to make. The system you describe (aka 'stutter box') is quite different to a proper anti-lag system, but it is a possibility for future developments. We'll look into it. 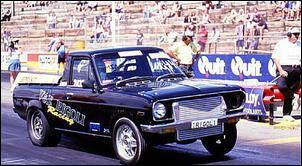 Very good article on the Holden Torana GT-R (Holden Torana GTR XU-1). When the original GTR was released to the public, Harry Firth already had a prototype XU1 on the road with the bigger motor and experimental carbs. Later, I believe there was there were four V8 versions manufactured and one was used as a tow car to Bathurst in 1972 or 1973. It was commonly known as the "Lockwood" in reference to the two small Lockwood padlocks on the bonnet to stop anyone opening it without authority! 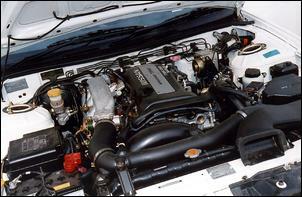 I just want to ask if the engine gasket of a 4G93 engine will fit in a 4G91 engine (DOHC Mitsubishi). We're not sure. Try asking the question on a related forum or at your local Mitsubishi dealer. Also, be aware that the gasket (we assume you mean head gasket) might fit, but it may have a different thickness affecting compression ratio. 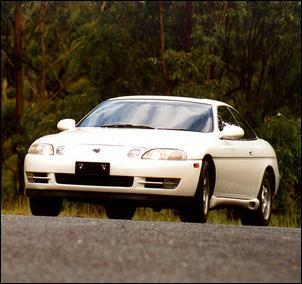 Re your Toyota Soarer 3.0-litre 6 cylinder test - Soarer 3-litre. You stated fuel consumption was 12.7L/100km but it didn't say city or highway cycle. I'm trying to compare to the SC400 report, which states fuel consumption for both cycles. 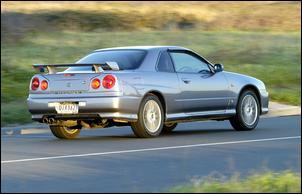 I was contemplating making my Nissan EXA a twin turbo. I've bought a T25 turbo from a S13 180SX along with injectors. I am thinking I will need to do something to the computer - either put another chip in there or buy a new system. Will there be enough room in the engine bay for the extra turbo? I have already installed a top-mount intercooler with a blow-off valve and boost controller. Is this going to be possible and how much do you reckon it'll cost? 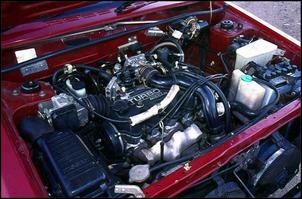 Two identical turbochargers are necessary to run a simultaneous twin-turbo system and the T25 is too big for this configuration on the E15ET motor - there would be huge lag. Good results might be achievable with a sequential twin-turbo system but the cost and complexity of such a system would be prohibitive. We suggest simply bolting on the T25 in place of the existing T2 - we have seen impressive results from this mod. 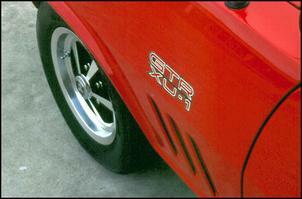 Standard management should suffice so long as the fuel and ignition system are in good condition. In any case, it's a good idea to keep check on air-fuel ratios. Great mag - keep it up. 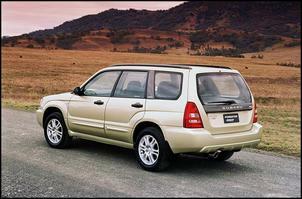 I just wanted to know if you are going to be testing the new XT Subaru Forester? I had a short test-drive in one the other day and was quite impressed. Considering how upset certain people were about your comment on the Astra keeping up with the WRX, I wonder how they will feel about a family wagon keeping up with them? Considering the STi move to a 2.5-litre, I wonder how long it will be before we see STi bits letting XTs smoke local Rexs... And, while I am upsetting people, I saw on the Forester forum an ad that had been in a US paper that stated that the Forester was quicker to 60 mph than the Nissan 350Z! The new Forester would have to be one of the best sleepers around - ditch the Geolanders, tweak the suspension and do the usual boost and exhaust mods and you would be laughing. Great for really fast soccer mums!